The XFasten Transparent Double Sided Duct Tape is proud to have the best adhesive material that balances out adhesive bonding power and overall stability. It adheres to almost all surfaces, making this double sided tape a must-have product for many households in America. Why Choose The XFasten Double Sided Tape? Overall, the XFasten Double Sided Tape is a cost-effective premium adhesive solution for your home and office projects. 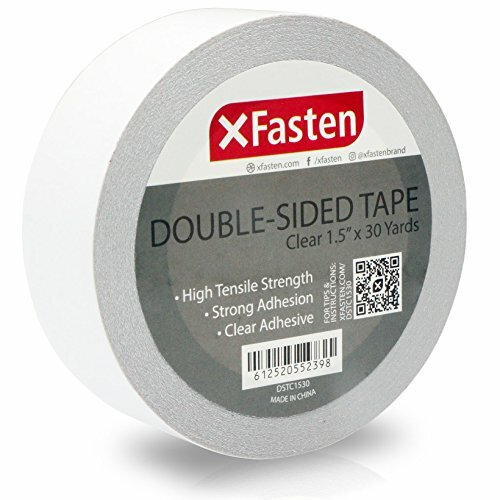 Where Can You Use The XFasten Double Sided Tape? EMPOWERS THE AVERAGE AMERICAN HOMEOWNER to come up with NEAT and PRO-LEVEL APPLICATIONS all thanks to its clear surface and mess-free installation. This double sided sticky tape offers medium duty adhesion and is removable making it ideal for DECORATING EVENTS ON TEMPORARY SPACES such as auditoriums, churches, conference rooms, classrooms, apartments and other locations where the tape needs to be removed later. Ideal for surface protection of leather seats, sofas and furniture from pet scratches, sealing, light repairing, and other adhesion applications. CRYSTAL CLEAR AND RESISTS YELLOWING-making it perfect for furniture applications as the color and texture beneath it can still be displayed clearly. Resists curling, unnecessary splitting and shredding. Easy to pull out of the roll, cut and install. Manageable and is resistant to UV, heat and moisture-making this tape an all-rounder in both indoor and outdoor applications. If you have any questions about this product by XFasten, contact us by completing and submitting the form below. If you are looking for a specif part number, please include it with your message. Pro Stick 5023 65 Hi-Strength Spray Adhesive - 17 oz. Dry Erase Labels Stickers with Dry Erase Marker-Heavy Duty 4 mil Vinyl White Board Wall Stickers-Pack of 80 (1" x 2.5") Removable Peel and Stick Labels-Many Kinds to Choose from-Made in the USA!